We are delighted to announce a forthcoming exhibition of Roger Mayne’s vintage London and Paris photographs to be held here at Quaritch. It will comprise of small-format vintage prints, from iconic images of children playing to views of Paris photographed the year before his renowned Southam Street series. The exhibition will run Wednesday 10 to Friday 19 May at our shop at 40 South Audley Street. Please contact us if you would like to receive further details. 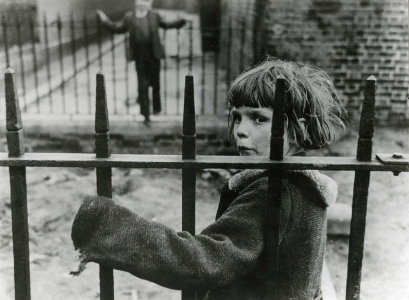 In the meantime, you can see Roger Mayne’s work at two current exhibitions. The Photographers’ Gallery in London is the first major exhibition since 1999 to show Mayne’s iconic work. Thelma Hulbert Gallery in Honiton, Devon, is exhibiting Mayne’s large-scale photographs of Southam Street. These prints were hung in the barn at the photographer’s home in Lyme Regis and now remain in a fragile state revealing layers of age and decay. Roger Mayne, The Photographers’ Gallery, until 11 June. More information here. Beyond the Lens, Thelma Hulbert Gallery, 11 March-22 April. More information here.